This guide will explain how to setup and operate a MachineMotion system. It will detail the Apps download process and how to run these on the controller. MachineMotionTM is an integrated automation controller. It contains all the necessary components to rapidly create general automation projects. 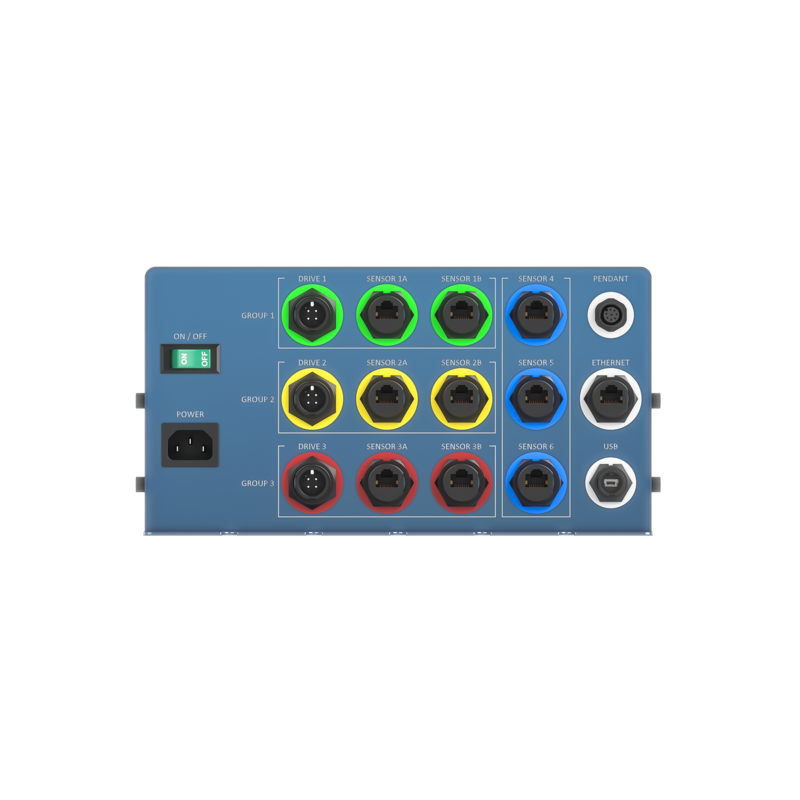 Its embedded single-board computer, multi-function sensor inputs and color-coded connections greatly simplify the system setup time and configuration. On the software side, even users with limited programming experience can create automated machines thanks to MachineLogic. About This Guide This guide will explain how to setup and operate the MachineMotionTM. It will detail the Apps download process and how to run these on the controller. Required Hardware Components To best navigate this user guide, it is recommended to have a MachineMotionTM controller at hand. A computer with Google Chrome and an internet connection are also required. Starting with a MachineMotionTM controller, automated systems can be built by adding nothing besides Vention sensors and motors. 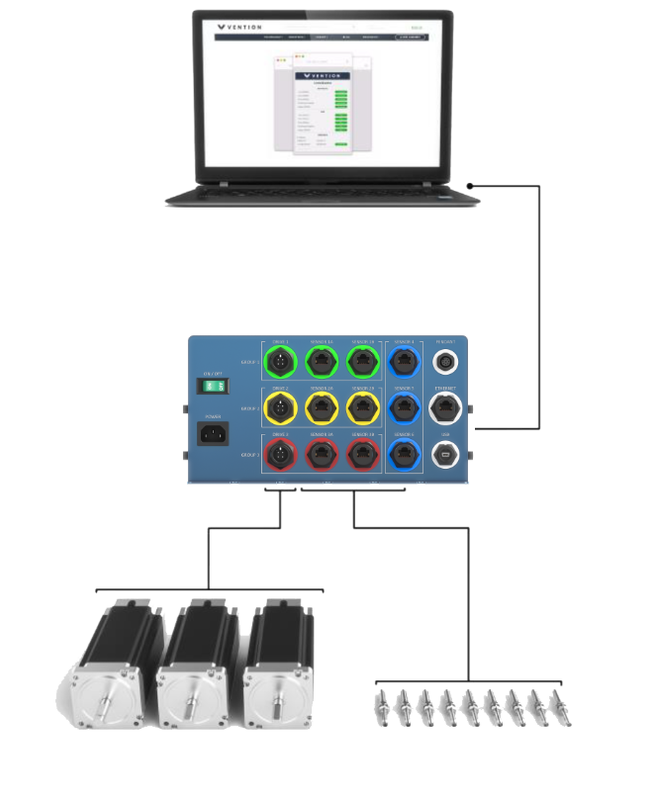 As shown in Exhibit 2, MachineMotionTM provides up to three high power motor outputs, up to nine multi-function sensor inputs, and Ethernet connectivity via RJ-45 and USB. No software installation is required to interface with MachineMotion. A computer with a web browser is sufficient to access the controller, launch Apps and controls machines. Power Switches ON / OFF Switch The front panel switch shall be used for regular power-up and power-down of the equipment. Emergency Switch The emergency switch located on the top panel of the unit (see Exhibit 3) can be used to de-energize the unit. It should be left in the ON position in during regular use. Rotate the upper red portion clockwise to disengage it from its safety OFF state. In case immediate interruption of the equipment is required, simply press the switch down towards the enclosure. Bottom Panel The MachineMotionTM bottom panel regroups all the ports that are available on the system. See next page for a description of each port’s functionality. Ports POWER The power cord should be used to connect 100-120 Vac to the POWER port. If an extension power cord is utilized, it is important to use a proper 3-prong cable with an adequate earth grounding connection. SENSOR Sensors are color coded and labelled with their respective port name for ease of installation (See Exhibit 5). Sensors related to the operation of a specific drive output are labelled so that they are connected to the same color group. Sensor signals are used by the control Apps to control end-applications. Important Note on Homing Sensors The default home sensor for each axis is port A. For example, the default homing sensor for axis 1 is SENSOR 1A. If the direction of the axis isd, the homing sensor also needs to be re-configured and needs to be connected to port B. For example, if the direction of axis 1 isd (using the user interface configuration settings) the homing sensor needs to be connected in the SENSOR 1B port. DRIVE The drive ports are used to power motors. Drive ports are color coded and labelled with their respective port name for ease of installation. 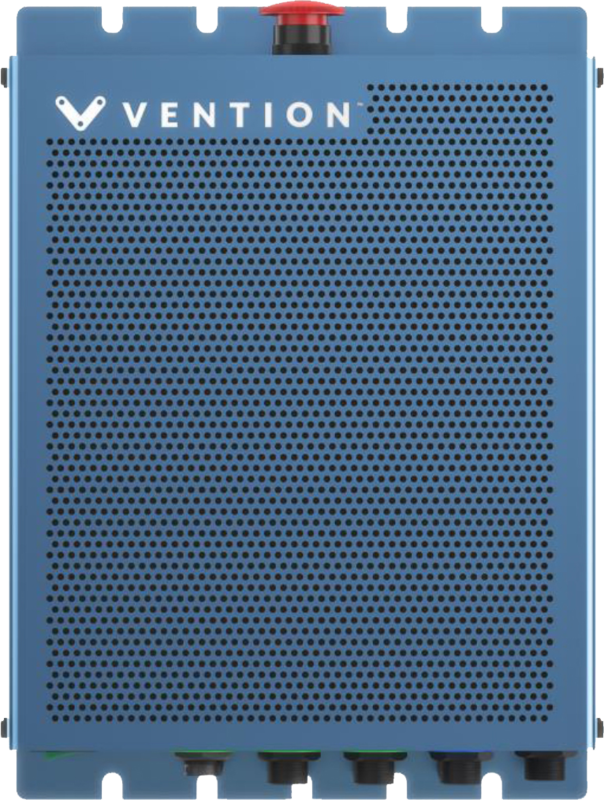 PENDANT MachineMotion™ Pendant provides a plug and play touch screen interface for automated equipment powered by the Vention MachineMotion™ controller. When connected to the MachineMotion™ controller, the pendant enables machine operators and administrators to run and modify their MachineApps through an intuitive, code-free user interface. MachineMotion™ comes with pre-loaded control and machine operations software. ETHERNET The ethernet network port connects the internal single-board computer to an external ethernet network. This port should be connected to either a computer or to an accessible ethernet network. USB The USB port provides connectivity to the controller using the default fixed IP address. It is useful for users that do not have access to a network connection nor an ethernet port on their computer. It is also the default port to configure the system during commissioning. Network Setup The MachineMotion controller communicates via an Ethernet link through its USB and ETHERNET ports. This link can be peer-to-peer, that is between a computer and the controller, or part of an actual local area network. 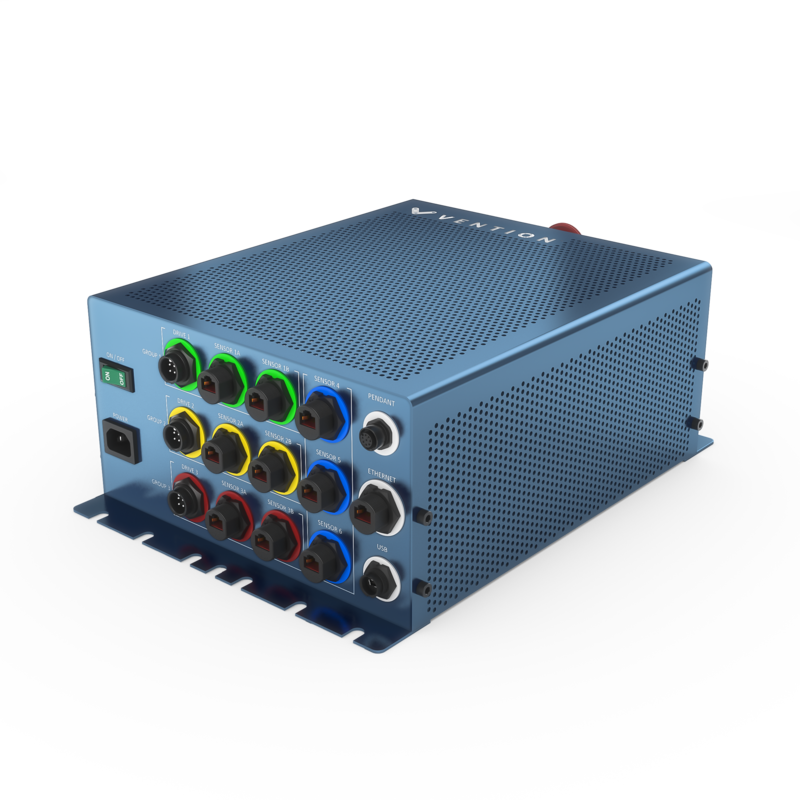 The MachineMotionTM controller offers a graphical user interface. For simplicity, only a web browser is required to access it. Google Chrome version 51 or above is recommended. Giving Internet access to MachineMotionTM is not necessary for operation but is required to download new Apps and software upgrades. It suffices to connect the controller to a LAN that has Internet connectivity for the controller to access the web. Table 5 details the options that can be used to connect MachineMotionTM to a host computer and optionally to the internet. If the MachineMotion unit does not have Internet access, it can still be controlled by a host computer provided that the appropriate Apps have been previously downloaded on the unit. Computer to MachineMotion using USB USB Computer USB Port This option requires a special procedure to be connected to the internet. ControlCenter When connecting to the MachineMotionTM controller via a web browser the home interface that appears is called ControlCenter. 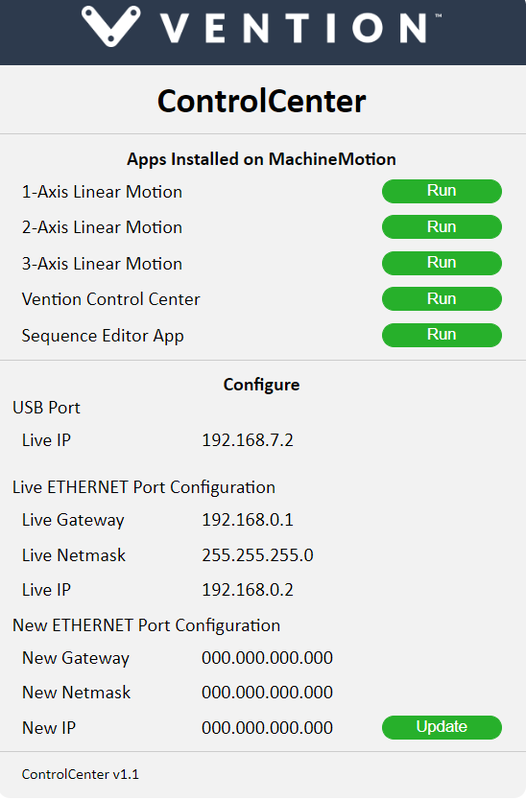 This interface is used to download and select which App to run on the MachineMotionTM controller. It can also be used for basic configuration of the system. Accessing ControlCenter The following steps can be followed to connect a computer with MachineMotionTM for the first time. Ensure the unit is not connected to a power outlet. Ensure the ON /OFF switch is in the OFF position. Connect the sensors and drives to their respective ports. Connect MachineMotionTM to the host computer using the USB port cable. Turn the emergency switch clock-wise to ensure the unit can be energized. Use the ON / OFF switch to power the system. - The ON / OFF switch will light-up.- The internal cooling fans will be audible. Downloading Apps Apps can be downloaded and installed directly from the ControlCenter App. Installation is transparent. It is automatically done after the download step and requires no action from the user. As seen on Exhibit 5, the download section lists all the available Apps that can be downloaded from www.vention.io/apps. Clicking the download button on the right side of an App name initiates the download process. The App will automatically be downloaded and installed on MachineMotionTM. Note that the App name will also appear in the Run section after this process is completed. Running Apps ControlCenter’s Run section can be used to run the Apps that have been downloaded. Clicking the Run button on the right hand side of the App name will toggle the browser to the App user interface. It can then be used to control the end application. IP Address Configuration MachineMotionTM has two IP addresses. The default IP address cannot be modified. This insures that the unit can always be accessed via its USB port. The second IP address, the one associated with the Ethernet port, can be modified to suit the user’s network requirement. The Configure section can be used to for this purpose.